Leonard Warren "Len" Webber MP (born November 10, 1960) is the Member of Parliament for Calgary Confederation and sits in the House of Commons as a member of the Conservative Party of Canada. He was elected to this position in October 2015 in the newly created urban riding. Previously he was a Member of the Legislative Assembly of Alberta, representing the constituency of Calgary-Foothills from 2004 to 2014, initially as a Progressive Conservative and in his last six months in office as an independent. Webber was born November 10, 1960 in Calgary, Alberta. His father, Dr. Neil Webber, served as the Member of the Legislative Assembly for the constituency of Calgary-Bow from 1975 until 1989 and was also a member of cabinet. (Len) Webber graduated from the University of Calgary with a Bachelor of Commerce degree and went on to acquire his Journeyman Communications Electrician certificate from the Southern Alberta Institute of Technology (SAIT). He then pursued work as an apprentice electrician and managed his own contracting company for 10 years. Prior to seeking office, Webber served as vice president and director of the Webber Academy, a private, non-profit school in southwest Calgary for children from junior kindergarten to grade 12 founded by his father, Neil Webber. Len Webber first sought public office in the 2004 provincial election in the constituency of Calgary-Foothills. In that election, he received 57% of the vote. 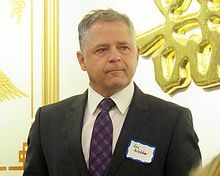 In addition to his responsibilities as MLA during his first term, Webber held the position of Deputy Government Whip and was chair of the Advisory Committee on Climate Change, the MLA Review Committee of Private Investigators and Security Guards Act, the Healthy Aging and Continuing Care in Alberta Committee, and the MLA Task Force on Affordable Housing and Homelessness in Alberta. He also acted as co-chair of the MLA Task Force on Continuing Care Health Service and Accommodation Standards Committee and served as a member of numerous other committees and boards. In the 2008 provincial election, Webber was reelected as MLA for Calgary-Foothills with 48% of the vote. He serves as a member of the Board of Directors for the Calgary Stampede, the Calgary Homeless Foundation, and WorldSkills Calgary 2009. Webber was reelected in 2012, and in March 2014 left the Progressive Conservative caucus to sit as an independent in protest against the leadership of Alison Redford. Webber resigned his seat in the legislature on September 29, 2014, one day after winning the federal Conservative Party of Canada nomination for Calgary Confederation. He was elected as the Member of Parliament for Calgary Confederation in the 2015 federal election as a member of the Conservative Party of Canada. Len Webber and his late wife Heather have three teenaged daughters: Lauren, Jaime, and Kelly. An avid volunteer, Webber has been involved with many community groups including Hospice Calgary, the MS Society, the Calgary Foundation, and the Alberta Alcohol and Drug Abuse Commission (AADAC). He is also a dedicated advocate for events surrounding breast cancer awareness and research. Webber is a recipient of the Alberta Centennial medal for his many philanthropic contributions. ^ a b "Webber's Legislative Assembly of Alberta biography". ^ Wood, James (March 12, 2014). "MLA won't remain a Tory 'with her as leader of the party'". Calgary Herald. Retrieved March 13, 2014. ^ "Premier Prentice running in Calgary-Foothills byelection set for Oct. 27". CTV News. September 29, 2014. Retrieved May 2, 2016. ^ "Calgary MLA Len Webber earns Conservative nod for vacant federal riding". Calgary Sun. September 28, 2014. Retrieved May 2, 2016. ^ "Calgary Confederation's Len Webber celebrates 'nail biter' victory over Matt Grant". CBC News. October 19, 2015. Retrieved May 2, 2016. ^ "October 19, 2015 Election Results — Calgary Confederation (Validated results)". Elections Canada. 22 October 2015. Retrieved 4 November 2015. ^ The Report on the March 3, 2008 Provincial General Election of the Twenty-seventh Legislative Assembly. Elections Alberta. July 28, 2008. pp. 206–209. ^ "Calgary-Foothills Statement of Official Results 2004 Alberta general election" (PDF). Elections Alberta. Retrieved March 3, 2012.